The Irish rockers are back on the scene after three years to treat fans to an epic arena tour in Ireland. 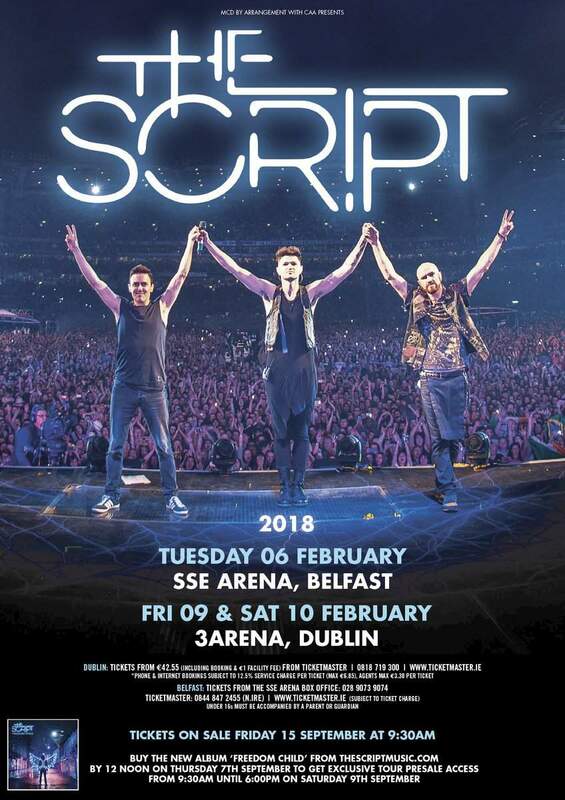 The band will perform live at the SSE Arena Belfast on Tuesday 6th February 2018 and then return to their hometown of Dublin to play the 3Arena on Friday 9th and Saturday 10th February 2018. When & Where can I purchase tickets? Tickets go on sale on Friday 15th September 2017 at 9.30am via Ticketmaster outlets and online at www.ticketmaster.ie. You can find a full list of ticketmaster outlets here. 9th & 10th February: 3Arena Dublin: From €42.55 incl. booking & facility fees. You will have to be quick because tickets are set to sell out fast. Fans will be treated to memorable live shows with the band performing their most recent hits and all the classics from the past decade. Listen back to The Script's first ever track 'We Cry' below.